We started the weekend off by me riding the kids to my friend's mom's house in the bucket bike for an easter egg hunt. I was told we looked like an easter parade pulling up in that. Haha! But, I have to admit, my calves were burning a bit riding all three kids in that. I've really only ever done two at a time. My friend's mom throws some amazing parties, and this one did not disappoint. Callum's favorite part was filling his easter basket with rocks in the backyard and poking the bunny with his finger. Connor and Isla had a grand ole time running around with their friends. And the four of us overstayed our welcome by about an hour after the party ended...when the lack of a diaper (who brings diapers with them when they have babies?! oops!) sent us riding for home. 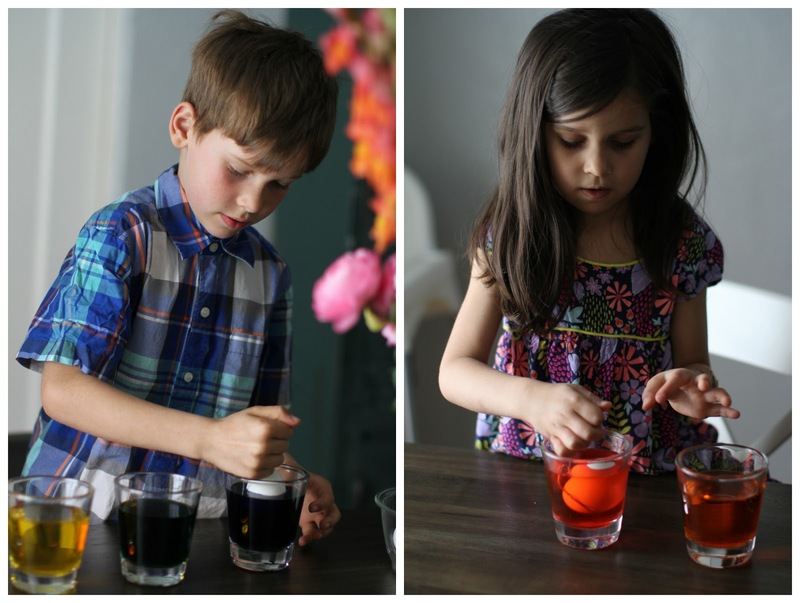 But it worked out because when we got home, Callum went down for a couple hour long nap and it gave me the perfect opportunity to let Connor and Isla dye some eggs. Now they really enjoyed the egg dying part, but I really think their favorite part was after that was over when I let them mix all the colors together...and make a huge mess. They claimed they were doing a science experiment. They were playing so well together that I let the mess slide. I can pretty much let anything slide when they are actually getting along and not fighting! Sunday morning we went to church together, then Ian took the kids while I worked in the nursery for the second service. After I was done we headed out to Ian's parents for lunch. My parents and brother came as well. It was pouring down rain, but that didn't stop the kids from running around in the rain collecting their eggs. After the kids were nice and hyper, we packed them up and headed back home for a quiet evening to ourselves. It was a good and full weekend. Full of friends, family and love.